Our coffee shop-style cappuccino with an unsweetened taste (1). Our flavourful beans have been decaffeinated using water. Crafted with natural coffee beans and fresh milk. A smooth, milky cappuccino with coffee shop-style froth in every cup. 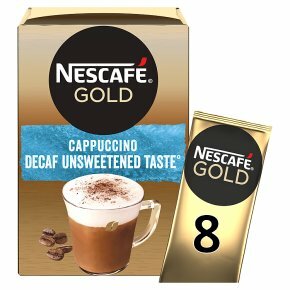 Create high quality coffee from 8 cappuccino sachets in moments. (1) Low sugar when prepared for an unsweetened taste.We expertly turn natural coffee beans into a great-tasting cappuccino that you can make at home or at work. Take a break with a NESCAFÉ GOLD Cappuccino Decaf Unsweetened Taste, our milky coffee shop-style drink. 1. Empty the contents of the sachet into your favourite mug. 2. Pour in 200ml of hot (85 C - not boiling) water and stir thoroughly. 3. Perfection takes time. Wait 20 secs and stir again. 4. For a creamier texture, gently tap your mug on the table. Now enjoy!